Oh. My. Gucci. I discovered the most adorable online jewelry webshop ever. It's Coloured-Candy. I got a few adorable jewelry and the packaging was very cute, the jewelry stunning and you can adjust everything to your own size! They also left a very sweet and personal note with it. Yes, I'm totally satisfied. I received this super cute pink box with their logo in gold. It also has a bow around it (I adore bows). I think it looks so sweet and it really feels like a present when you receive it. Perfect as a gift, or self-indulgence. When I opened the box their was a visitor card with a nice note on the back and I saw my favorite color every. A good start! The first thing in the box is an adorable and very chic ring. I love how sophisticated it looks! It will be perfect for a special dinner, gala or any other special occasion. Also, this ring is adjustable in size. 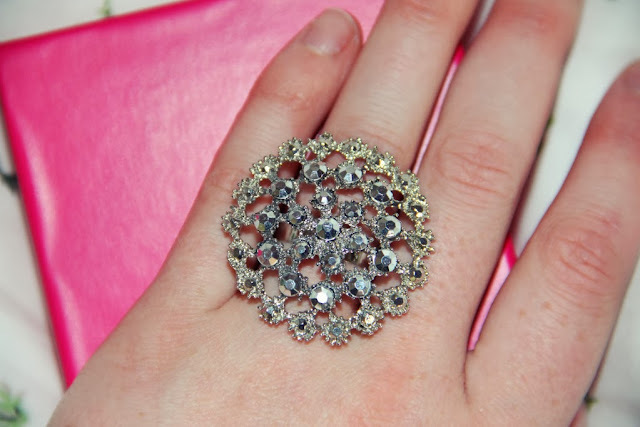 The outside ring contains smaller rhinestones, followed up by a ring of bigger rhinestones, another row of the smaller rhinestones and one bigger rhinestone in the middle. Special thing: if you would like to purchase this ring, it's on sale now! You can get it here for €4,95 instead of €7,95 now. There was also this all-round thing in my little box. You can use it as a bracelet or a necklace. Something I like to do with such necklaces, is hanging my ring on their and wear it as a necklace. This way you will be able to wear a very unique necklace! The ring as a necklace looks great and gives the ring a totally different look! Finally there was an adorable fish bracelet in this cute little box. It has the shape of a fish and looks so cute! You can wear it alone or with several other bracelets. 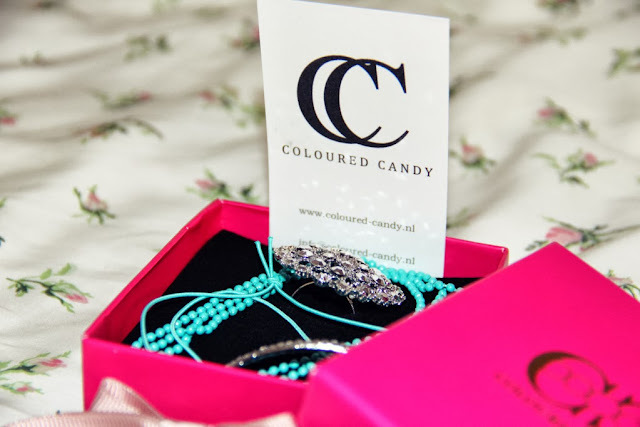 Coloured Candy also sells sets of for example turquoise bracelets. You can see one of them here. It has this bracelet and the other one I showed you in this post. This is the personal note. It says: "Hi Lovely Lady, Have fun with your jewelry (you can change the sizes yourself) xOx Coured Candy". So sweet and nice! Stay tuned for an outfit post with these jewelry! I really love silver and turquoise jewelry, what are your favorite jewelry colors? 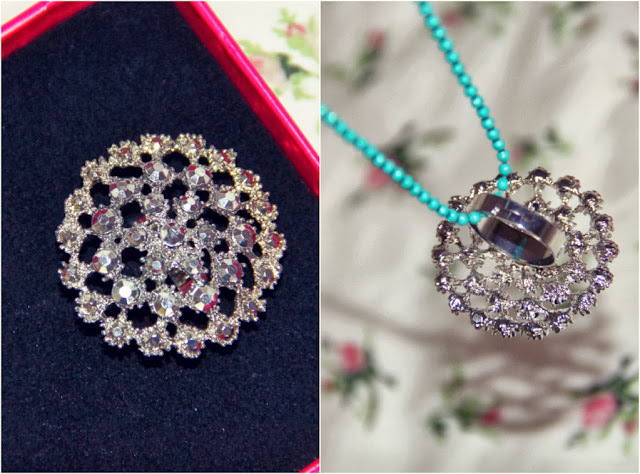 That really its a adorable box and beautiful jewelry. aw, and the packaging is lovely. Echt een leuk pakketje !! So pretty! The turquoise color is gorgeous. Voor mij is het net iets te veel glitter, maar de kleur vind ik wel echt heel erg mooi! Ik volg je via Bloglovin. Misschien kun je een kijkje nemen op mijn blog? Ik heb nu ook een winactie lopen met een bodylotion van Victoria Secret!! Lovely jewellery! You are a lucky girl ;) Thank you for stopping by! I really love your ring ! Wauw, ik vind het fish armbandje echt prachtig!